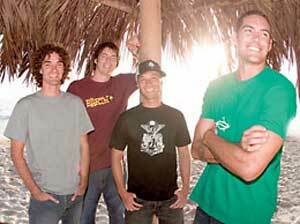 Nobody lives "aloha"-a Hawaiian word literally translated as "friendly and welcoming"-better than Olivia The Band. Its members Reed Cromwell (lead vocals, bass), Gabe Watts (guitar), Justin Abilla (lead guitar) and Christian Perreira (drums), who grew up on Oahu's North Shore, have been as close as brothers since childhood. The time the guys spent growing up together, where a day of surfing was as common as "doing lunch" in most other parts of the country, set the stage for this band's development. After graduating high school, the band members pursued their collective musical vision and relocated to San Diego, Calif., a locale conducive to their avid surfing and water fun lifestyle. After several months of bringing its pop/punk sound to sold out crowds on the West Coast, Provident Label Group's Essential Records signed Olivia The Band to a record deal, with the band's national label debut set for an early 2005 release. Olivia The Band's high-energy, joyful sound is a reflection of its dedication to friends, family and faith. But the band came about almost by accident. "Back in the day we would go to see groups like Pennywise, Sprung Monkey and Blink 182. It was while driving home from a show in 1995 that we decided to start a band so that we could touch people like they had touched us," Abilla said, recalling their mission. Armed with a goal, the musicians went out and bought the best instruments they could afford and set out to learn to play them. "Christian had the most money, so he became the drummer," said Abilla, with a laugh. Not surprisingly, Olivia The Band has been compared musically to the likes of Blink 182 and Reliant K, groups among the ones that have inspired them. Their songs, which meld pure adrenaline with a faith-based Hawaiian backdrop, are written in collaboration by all four members, with the lyrical content written exclusively by Cromwell, the lead singer. The beat explodes with energy and passion, but a close listen reveals purpose beneath the drive. "I try to say something of worth, and my hope is that if some kid is super bummed out, he'll listen to us and it will help bring him through," Cromwell said. The amity of the guys is also shown in the significance of the band's name. "Olivia," which was christened in remembrance of the loss of guitarist Justin Abilla's baby sister, is as a reminder of the Paradise awaiting her and others in the hereafter. The commitment and talent of the group is quickly conveyed to anyone hearing its music. But a live performance shows Olivia's sense of fun and the love its members feel for their audience. While most bands leave the venue immediately following a show, Cromwell, Watts, Abilla and Perreira generally hang out with each person who approaches them, interacting until fans become friends. "The real fruit happens, for us, off-stage. It happens through conversations with people after our shows. The music plants the seeds, but the true ministry occurs as we share in relationship with this community of people-these new friends," Abilla said. Twelve tracks compile Olivia The Band's self-titled album due to drop January 18, 2005. Produced by Bob Burch, the first radio single, "Shut It Out," is currently adding at CHR/Rock formats.